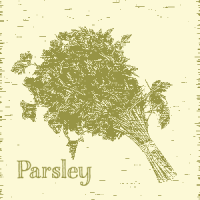 There are more than 30 varieties of Parsley. In ancient times, parsley wreaths were used to ward off drunkenness. Today, this slightly peppery, fresh-flavored herb is more commonly used as a flavoring and garnish. Parsley is an excellent source of vitamins A and C, and an essential ingredient in soup stock. Refrigerate, unwashed, in a microperf bag. Parsley contains three times as much vitamin C as an orange, boosting our immune systems, protecting against cardiovascular disease, keeping our skin elastic and minimizing wrinkles. Rich in vitamin A, folate, potassium, and calcium, parsley contains a wide array of antioxidants providing protection from arterial blood clotting, and dangerous free radicals. Certain phytochemicals found in parsley have been shown to slow the development of some cancers, prevent others, and help to reduce cholesterol. From bunched Italian Parsley, pinch off whole leaves for use in a green salad.